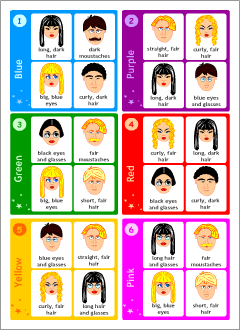 Worksheeets and classroom games that can help kids learn and practise some useful phrases for describing people in English. Scroll down to explore. 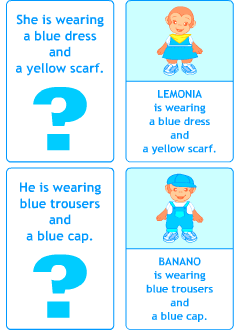 Below you will find a selection of printable readers, lesson posters, activity wokrsheets, test worksheets and learning games sets. Although designed as a complement of our online Describing People unit, these resources can be used separately in any way you want and need. Also, you can browse all 36 sets of printable resources in one place. Each set focuses on a particular topic, for example, Talking about the weather or Asking and telling the time, and contains readers, flashcards, worksheets, tests and classroom games to help students learn everyday expressions or phrases in a fun way. 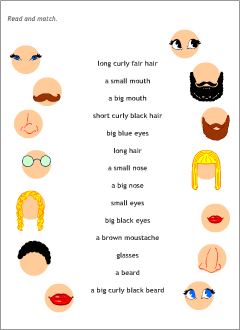 Readers, lesson posters, activity worksheets and tests to learn and practise English expressions in a fun way. Easy-to-read dialogues to improve reading skills, as well as to learn and practise English expressions. 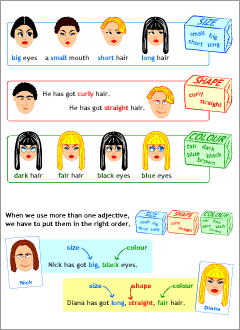 A lesson poster that introduces and explains new vocabulary through pictures and sentence examples. Simple tasks and exercises that give kids the chance to be familiar with new words and phrases. Simple tests and quizzes that help pupils to consolidate new material and revise what they have learnt. 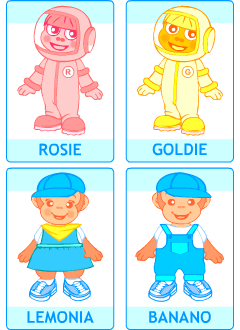 The games pack includes printable materials that you can mix and use in a variety of ways to play different learning games. To play guessing games; works both with and without cards. 24 cards for guessing games. Use them separately or with the board. 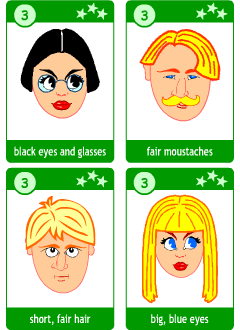 A set of character cards to play different language games. A double-sided cards with questions and answers. This is a question game for 2 players (or teams). In this game, there is one person asking questions and the other person answering questions. This game can be played individually, in pairs or small teams. Kids listen to the description, then find the right character.